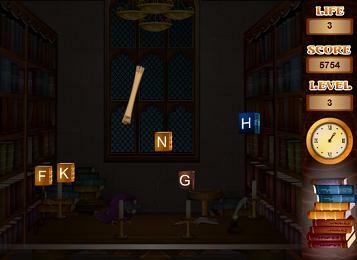 In Magic Library, type the letters as they fall from the ceiling to get points and move to the next level. Wait for the game to load, then click the "Start Game" button in the middle of the game. Note: This game has a big file size, so it might load a little slow. If you liked this game, you might also enjoy Air Typer. HOW TO PLAY. Type the letters you see falling from the ceiling. Accuracy counts, so try not to go too fast. When a scroll appears, press the Spacebar. You will have a few seconds to type the letters on the scroll. This game has an easy, normal, and hard level, so it's fun and challenging no matter your typing skill. Magic Library trains reaction time and typing skill. These brain skills are useful during any activity where precision and quickness are required. It also can improve your typing speed and accuracy.